I remember this too and many happy hours here dancing. 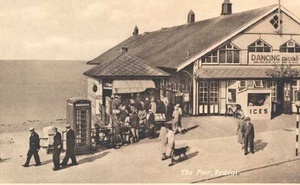 The beautiful pier has gone and all that remains is this building. The image taken it is believed from a postcard is possibly from the late 1940s or 1950s. There doesn’t look like there’s any structure beyond the shore end of the pier so late 40’s – early 50’s is a reasonable estimate. This is a photo of Redcar Pier Pavilion which was completely demolished in 1981 and not to be confused with The Regent Cinema, built over the entrance of Coatham Pier which is currently closed, needing extensive repairs. I used to go here in the mid 50s when I lived at Redcar as a young teenager, 5 Woodbines between 2 of us a lemonade and a glance from a girl we fancied, we went home happy.